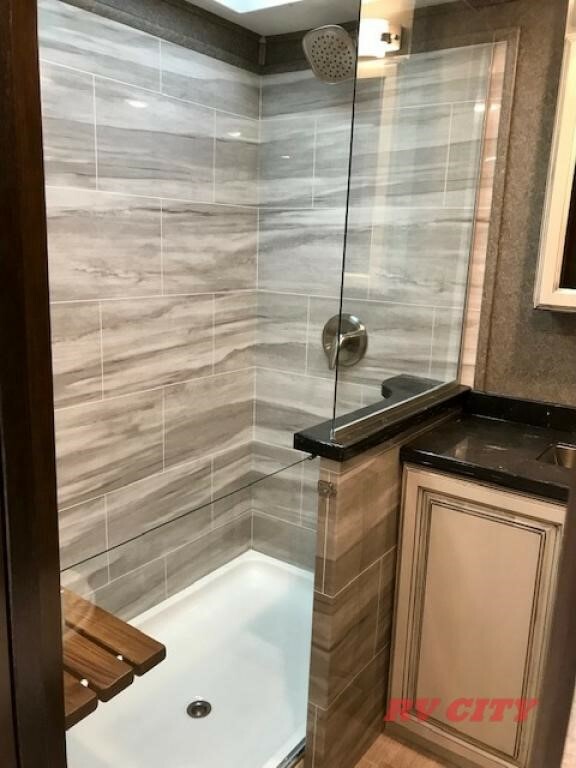 With the introduction of the beautiful walk-in shower in some of the new 2019 RVs, it got us to thinking: what about a mobile spa? Maybe we’re just dreaming here, or maybe we are on to the next big idea in the $94 billion global industry. The master bedroom becomes a massage room. Candles, soft music, and relaxing scents. A massage table where the bed currently lives (that bed can live elsewhere for now, right?). Next, you enter the living room, where you receive a pedicure or a manicure. Soothing ocean scenes play on the 50” TV as you unwind on the sofa with a heat and massage function, and let someone rub your feet beautiful. Lastly – assuming this dream scenario includes someone with the foresight to opt for the party deck option – you make your way out into the sun to enjoy a post-spa cocktail and the scenery. Perfect, right? What do you think? Should this mobile RV spa be a thing? Should it be your thing?